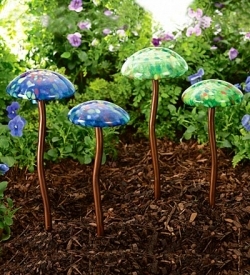 Magic toadstools. Pixie dust. Elves & fairies hiding in the woodland glen. Such is the enchanted world of Fairy Gardens. It is thanks to the wonderful imaginations of my beautiful grand-daughters that this element of magic has crept into my garden. From the addition of a simple saphire blue marble beneath the fronds of a delicate fern, to doorways hidden in tree trunks, my garden has become a hide-away for mythical creatures of all kinds. So whether it is a Unicorn you are hoping to entice into your private sanctuary, or you are looking for your Prince Charming in the guise of a frog, HAVE FUN, and let your imagination run wild. You never know when you might find that hidden pot of gold at the end of a sparkling summer rainbow! 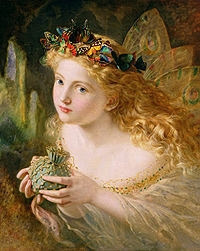 Throughout most of the former celtic nations: Ireland, Scotland, Wales, Brittany and Germany, the fairies are becoming things of the past. Even though fairies are commonly believed to exist today, from the eighteenth century and on they have been seen less and less. Once firmly ensconced in the minds of men, the fairies may now be in decline. That people do not often see them any more makes some argue that the fairies will eventually disappear as men stop believing in them." I have found Fairy Gardens to be a never-ending source of joy. Whether large or small, indoors or out, all you need is a bit of imagination in order to begin. My first endeavor into the magical realm was very simple... a hidden doorway on a tree. Almost completely obscured by the leaves of a nearby hosta, and framed by some lily-of-the-valley, the doorway simply appeared one morning - much to the delight of the "wee folk". It's as simple as that to begin. From there, let inspiration guide you. 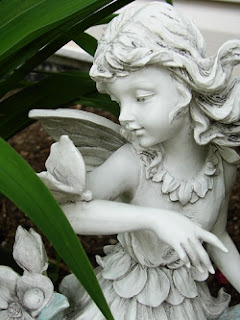 Add a bit of garden statuary under a tree. Set a toad house under a bush in a damp, shady corner. Sprinkle some fairy dust along an imaginary path to the home of the Fairy Queen. And be sure to get a new perspective on things by getting down low to the ground and looking under leaves. After all, you never know where you might find a Unicorn sleeping in the shade. 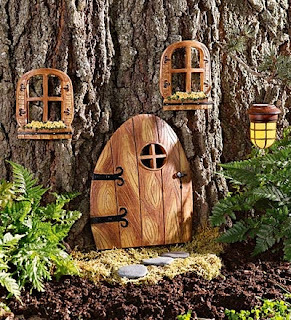 Once you have created some hiding places in your garden for these tiny, winged guests, you might want to give your special fairy land a name. Preschoolers are a great help here! And don't forget to send out invitations to local fairies, sprites, elves, wood nymphs, gnomes, and magical creatures of all sorts. They love to party and are always willing to celebrate a new haven for the "wee folk". Whether you choose to have a real party with little children in your area, or this is entirely imaginary, glitter and sparkle on hand-written invitations to mythical creatures, and a special tea party are fun ways to spend an afternoon. The only thing that has stymied me in the past has been the menu. Gnomes and trolls are great.... they will eat anything. But those little woodsprites have preferences for the unusual. Most, however, will eat "ants on a log" (celery stick filled with peanut butter and then studded with raisins). They also love to drink sparkling red nectar - cranberry cocktail with a touch of Sprite for bubbles. Just make sure the fairies don't have too much, because the bubbles go to their heads and then they fly funny. What's a party without amazing food? Here are some spectacular recipes from around the world guaranteed to please the fussiest little fairy or sprite. From easy creations the kids can help with, to an adult recipe that's best saved for after the party, let your imagination run free and have fun as you enjoy tasting these wonderful creations. Your little Fairy will love serving this enchanting drink at her next midsummer night's garden party. It is also a refreshing little treat for her after a long day of chasing dragonflies and butterflies by the pond. Apple pie so good you'll tell yourself a fairy tale about how all the calories have been magically cooked out so you can have a second piece. Although time consuming, this prize-winning recipe (originally printed in a newspaper) is delicious with an adult sauce that is optional. 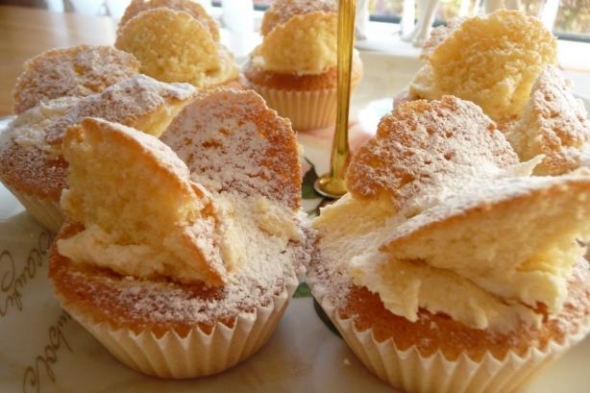 These delightful little cakes are easy to make and are ideal for gifts, high tea, picnics and parties. The recipe was created for the Lavender Trust, a British charity for young women with breast cancer. A popular treat at children's parties in Australia. So simple even the kids can make it. An absolute must for ANY children's party or even dare I say, adult parties too... weddings, girls night's in, showers, pajama parties & sleep overs, retro buffets, etc. You can definitely expect these to FLY off the plate! Every self respecting Southern lady must have the perfect recipe for fried chicken and Fairy Bell claims this one. The cooking time includes marinating in a brine overnight. So cute - and healthy too! Made with tomatoes, eggs & spinach. You'll be surprised how they turn out! This is such a simple thing to do. Ideal for your fairy garden tea party. A unique smoothie made with avocado! Yummy little cakes. Loved by all my family. The recipe was found in a booklet published for a childrens' school as a fund raiser. This is one that your kids will absolutely adore. Expensive to buy, but quite easy to make. And absolutely delicious to eat!